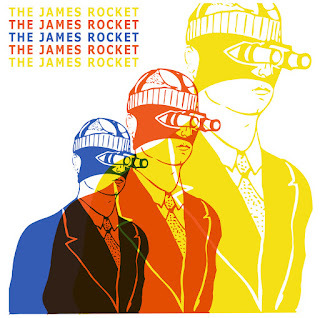 If It's Too Loud...: The James Rocket - "We Are Here for You" b/w "Derby Girl"
The James Rocket - "We Are Here for You" b/w "Derby Girl"
Brooklyn's The James Rocket are back with their first release since 2012's Launch. It's just a 7" single and not a full length album, but new music is always welcome. The A-side is "We Are Here for You" is 90s style power pop at it's finest, with the sweet melodies of Big Star mixing with the fuzzy guitars of Guided By Voices. The B-side, "Derby Girl," is an ode to roller derby girls, possibly the best kind. It's all just power pop perfection, highly polished with just enough grit to make it interesting. Hopefully they won't be waiting four years between releases for the next one. "We Are Here for You" b/w "Derby Girl" is available today. You can download a digital copy for free on The James Rocket's Bandcamp. You can also order a physical copy there, too. If you live in or around NYC, the band is playing a release party tonight at The Bitter End on Bleeker Street. For more info, check out their website.